When Thursday evening’s nasty weather system began taking shape west of DeKalb County, NIU police officers quickly staged in the residence halls, ready to move students and staff to safety. They’d trained numerous times for this situation through various types of exercises, including “tabletop” scenarios that twice have included the university president and his cabinet. Another drill is already on the calendar for Friday, May 1. Meanwhile, monitoring the situation from the field, NIU meteorologist Gilbert Sebenste remained in constant contact with the Department of Public Safety. Police dispatchers were prepared to broadcast an emergency message through the campus loudspeaker system, Rodman said, when Sebenste called again to report that the tornado’s track had shifted away from campus. Their night was just beginning, however. Rochelle police soon requested mutual aid in tiny Flagg Center while the DeKalb County Sheriff’s Department asked for support in the small Route 72 community of Fairdale, which had sustained profound devastation. NIU dispatched two Huskie Safe Line vans to Fairdale, where the vehicles served as warming stations and transportation for families who had lost their homes. At the same time, Chris Gilbert, assistant transportation manager for NIU Transportation Services, drove a 56-passenger charter bus to the eastern edge of Fairdale. Two buses originally had been requested, Gilbert said, but DeKalb’s Voluntary Action Center sent its TransVAC bus. The NIU bus provided a warm space and shuttled people to the shelter set up at the nearby Kirkland Fire Station. The NIU officers who responded to Rochelle’s call formed a caravan of nine vehicles; the squads in front and back ran lights and sirens through the dark, country roads. Rodman’s crew helped to set up a perimeter around the Flagg Center wreckage and provided traffic control while local fire and street personnel continued to clear the roads and search for survivors. NIU officers also responded to Grubsteakers, the restaurant on the northeast corner of Routes 251 and 64, where a dozen people were trapped in the cellar. All were rescued, however, by the time NIU reached that scene. 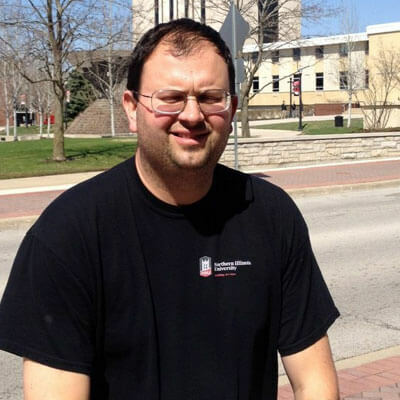 The veteran NIU police officer won’t easily forget what he experienced Thursday night. “Stop signs were completely leveled. A silo was torn in two; one part on one side of the road and the other on the other side of the road. There were full fields of trees that were completely gone. Individuals who had equipment were out there trying to clear the roads themselves,” Rodman said. 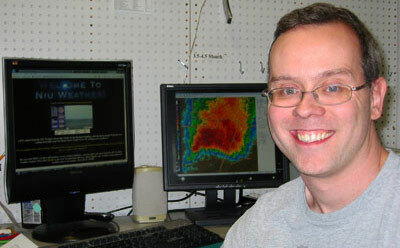 NIU meteorologist Gilbert Sebenste had a good inkling Monday of the weather that lie in store Thursday – a “favorable environment” for tornadoes – and duly alerted top university administrators of his forecast. By Thursday afternoon, Mother Nature was proving him right. Warm moist air surging north from the Gulf of Mexico. A warm front draped across the area, providing wind shear to make the storm rotate. A center of low pressure approaching Illinois to add to the lift. A powerful jet stream aloft that would create more wind shear. At the end of his shift Thursday, with nothing imminent on the radar, Sebenste zipped home to the north side of DeKalb for a quick dinner. He kept one eye close on the system, and when he saw the strong rotation begin to develop, he grabbed his camera and jumped in his car. “I thought, ‘That’s it. That’s the storm, and it’s going to latch onto this warm front. I don’t know what it’s going to do, but I need to be on it,’ ” he said. Sebenste turned his car toward Malta; when he reached Willrett Road, he watched as the storm “blasted” north. 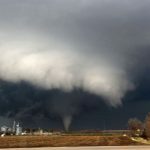 Maintaining constant contact with public safety officials from NIU and the DeKalb police and fire departments, he relayed to each agency the good news that the fast-moving twister would pass northwest of the city. 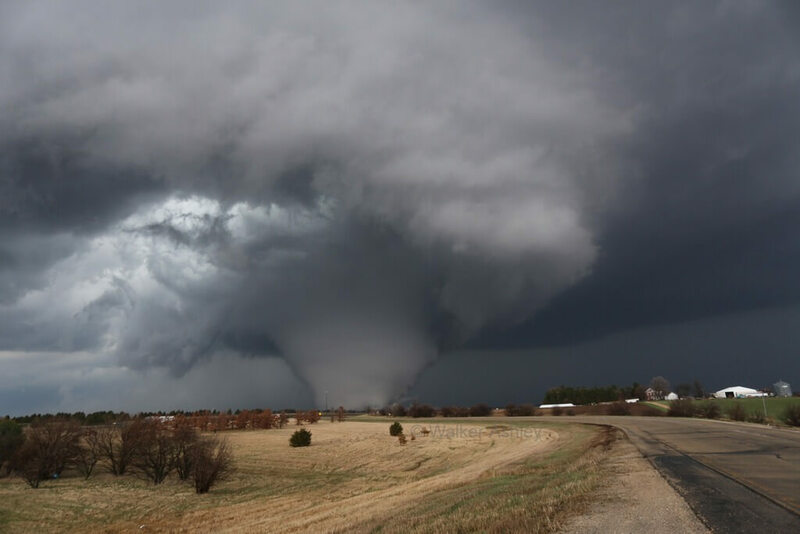 Reaching the pavement of Esmond Road finally gave him a chance to match the tornado’s pace. “The earlier tornado that went near Rockford and Belvidere actually laid out a blast of cold air right on the warm front just north of Rochelle and enhanced the warm front. It made the air very turbulent,” he said. And NIU’s meteorologist had a front row seat. Driving into the small community unveiled a nightmare. Sebenste parked his car to block the road; no emergency responders were on the scene yet, and some traffic was still trying to enter the devastation but was blocked by debris. He glimpsed tree trunks standing debarked, their branches strewn across the ground. Wreckage was spread everywhere he looked. Soon he encountered a couple people emerging from a destroyed shed. When emergency responders arrived, Sebenste knew there was little else he could do. He returned to his car and drove away, some images imprinted and others unwanted. 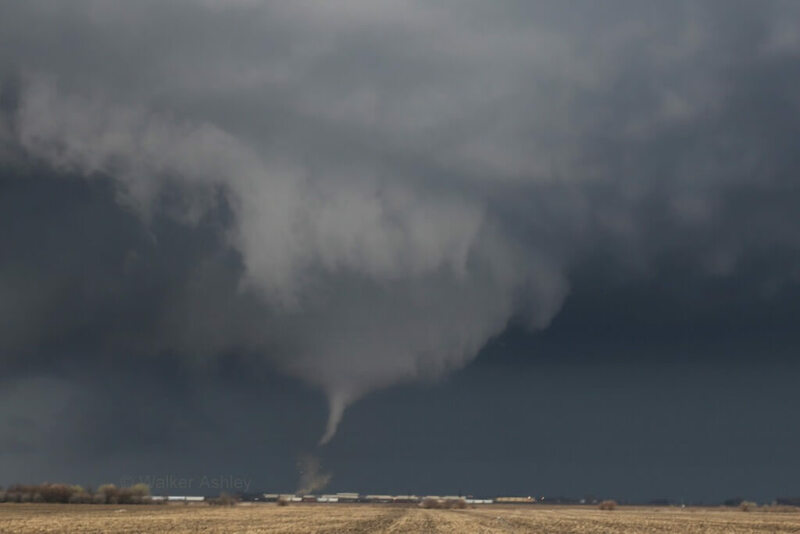 NIU meteorology professor Walker Ashley captured a series of stunning photos of the tornado as it developed near Franklin Grove as “a small elephant trunk” and traveled in a northeasterly direction. The tornado gained in strength and size, became wedge-shaped and then sideswiped the community of Rochelle near Route 64 and Interstate 39. 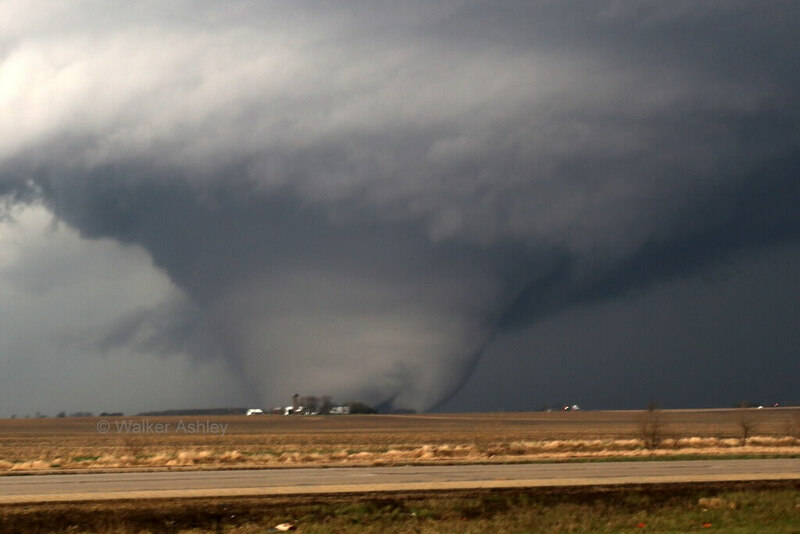 “It’s what we call a long-track tornado,” Ashley said Friday morning, adding that it was probably on the ground for 50 miles or so, if not more. 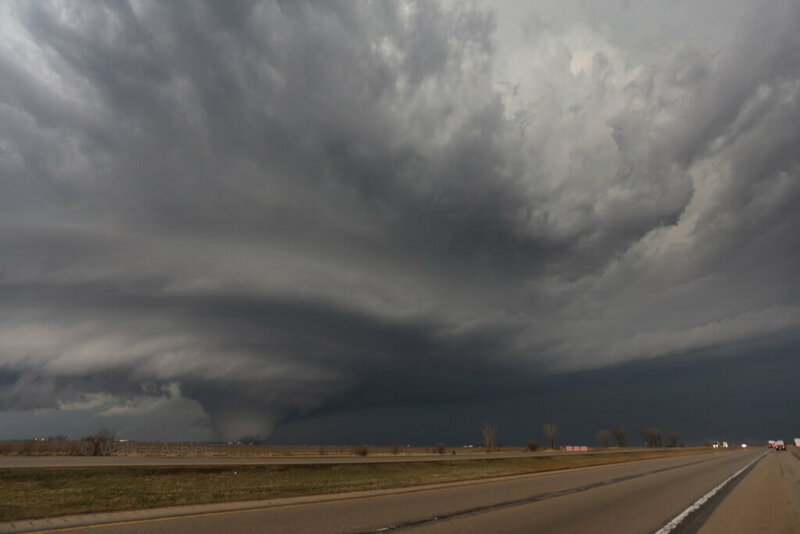 An experienced storm researcher, he estimated the tornado was traveling between 45 and 50 mph and said he followed it from a distance in his vehicle for 60 to 90 minutes. He said the National Weather Service did an excellent job with its forecast and warnings, allowing people to prepare. Ashley spent his day on Friday with Stephen Strader, a Ph.D. student in the Department of Geography, which houses the meteorology program, and NIU alum Victor Gensini, a professor at the College of DuPage, as they assisted the National Weather Service in its post-storm survey of the damage path. The survey will help determine the start and end points of the tornado, along with its width and magnitude. 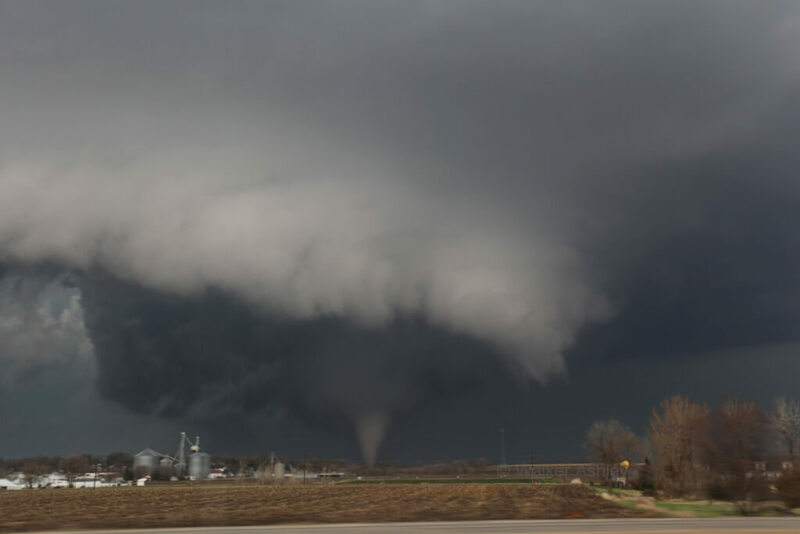 As Thursday night’s storm bore down on Rochelle, Andy Reiss and his family were racing south to the home of a friend willing to share the safety of his basement. In the meantime, his wife, Kim, was on her cell phone warning Betty and Ray Kramer to get to safety. The phone went dead around 7:15 p.m. The next time Andy and Kim spoke with the Kramers, they were media superstars, having been among the 12 people who were taking shelter in the basement of Grubsteakers restaurant when it collapsed. That is when the phone went dead. When they arrived, their hearts sank. “It was an absolute disaster. Indescribable. The building had collapsed. There was debris everywhere, and the air was just filled with the smell of ozone from the downed electrical lines. State police made us leave pretty quickly,” Reiss said. They returned to the home of their friend where they had left their children, still unsure of the fate of the Kramers. They watched news reports of rescue efforts, but did not know the Kramers were safe until sometime after 9 p.m. when the state police called and asked him to pick them up at a gas station near the restaurant. When Reiss was reunited with the Kramers, they had an amazing tale to tell. It was a story that they already had shared with a reporter from WLS-TV in Chicago. The account quickly spread through other media and online, making its way around the world in no time. 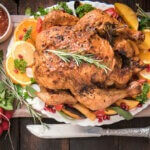 Just after the phone went dead, the Kramers pulled into the parking lot of Grubsteakers. Ray paused at the doors to take a couple of photos of the approaching tornado when the owner demanded he come inside and retreat to the basement with everyone else. “And no sooner did we get down there when it hit the building and laid a whole metal wall on top of the doors where we went into the storm cellar,” he told the television reporter. The building shook violently and the noise of the destruction could be heard clearly from the cold storage area of the basement where the Kramers huddled with restaurant employees and customers. “When the tornado hit, we all got a dust bath. Everyone in there got showered with dust and debris falling out of the rafters,” Kramer said. For the next 90 minutes, the Kramers and the 10 others in the basement prayed and waited as rescuers cut and ripped through the debris to reach them. They emerged unharmed and were dropped at the gas station a short time later. “It was amazing. I was more shook up than he was,” Reiss said of his friend. When Reiss returned to his own home he was relieved to see that his home had sustained no damage. Tornadoes are not measured on wind speeds but the amount of damage they cause. 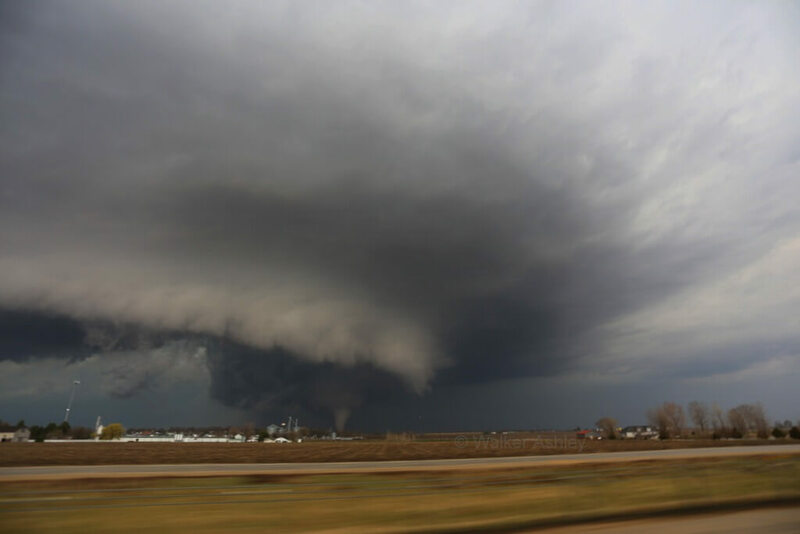 Consequently, Sebenste said, Thursday’s twister is likely to rate “between an EF3 and EF5” on the Fujita scale after National Weather Service personnel conclude their investigation. Meteorologists will review objects hit – houses, trees and telephone poles, for example – and compare the wind speeds needed to achieve such damage with results from previous engineering studies. Very Interesting. Thank you for the coverage. Glad there wasn’t a huge lose of lives. Beautiful photos, I hope you passed them on to The weather Channel! I’m so glad the tornado moved away from NIU! That was a monster of a storm, wish it hadn’t wiped out Fairdale . These pictures of the storm are absolutely amazing and unbelievable. Walker Ashley is courageous and brave to have ventured out to get these extremely telling photos! A once in two lifetimes event!!! So glad the path did not cut through the center of a major city. Always some blessing to be seen out of a tragedy. Great coverage here of a truly historical event. So sorry for the suffering and life altering days ahead. 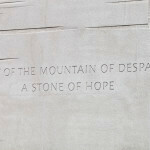 We stand in awe of nature’s power and devastation. I live in Flagg Center, just a couple of miles from Skare Park, and from our kitchen window we watched it drop out of the sky when it first started in Franklin Grove/Ashton. It was coming straight toward us but took a slight northerly turn and hit Skare Park and 2 subdivisions. 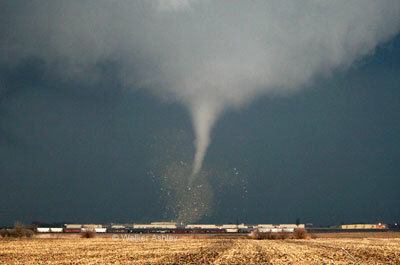 We were very lucky as was my nieces who live in Kings, IL. Just by the grace of God did it miss us all. Thank you for the story about your experience. I will never forget this.